Neuroscientists have closely analyzed where and when the brain becomes active for many years, but now researchers at Washington University School of Medicine in St. Louis are gathering evidence that the frequency of that activity can be a source of important insights. The discoveries are made possible by a grid of electrodes temporarily installed directly on the surface of a patient's brain to help pinpoint the source of medication-resistant seizures. Scientists at Washington University School of Medicine in St. Louis have tuned in to precise frequencies of brain activity for new insights into how the brain works. 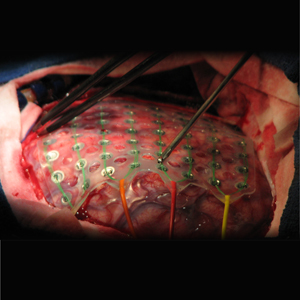 The researchers used electrocorticography, a technique for monitoring the brain with a grid of electrodes temporarily implanted directly on the brain’s surface. Clinically, Leuthardt and other neurosurgeons use this approach to identify the source of persistent, medication-resistant seizures in patients and to map those regions for surgical removal. With the patient’s permission, scientists can also use the electrode grid to experimentally monitor a much larger spectrum of brain activity than they can via conventional brainwave monitoring. Scientists normally measure brainwaves with a process called electroencephalography (EEG), which places electrodes on the scalp. Brainwaves are produced by many neurons firing at the same time; how often that firing occurs determines the activity’s frequency or wavelength, which is measured in hertz, or cycles per second. Neurologists have used EEG to monitor consciousness in patients with traumatic injuries, and in studies of epilepsy and sleep. In contrast to EEG, electrocorticography records brainwave data directly from the brain’s surface. Leuthardt and his colleagues have used the grids to watch consciousness fade under surgical anesthesia and return when the anesthesia wears off. They found each frequency gave different information on how different circuits changed with the loss of consciousness, according to Leuthardt. Their results also showed a series of changes that occurred in a specific order during loss of consciousness and then repeated in reverse order as consciousness returned. Activity in a frequency region known as the gamma band, which is thought to be a manifestation of neurons sending messages to other nearby neurons, dropped and returned as patients lost and regained consciousness. The results appeared in December in the Proceedings of the National Academy of Sciences. were saying a word they had heard or a word they had seen.